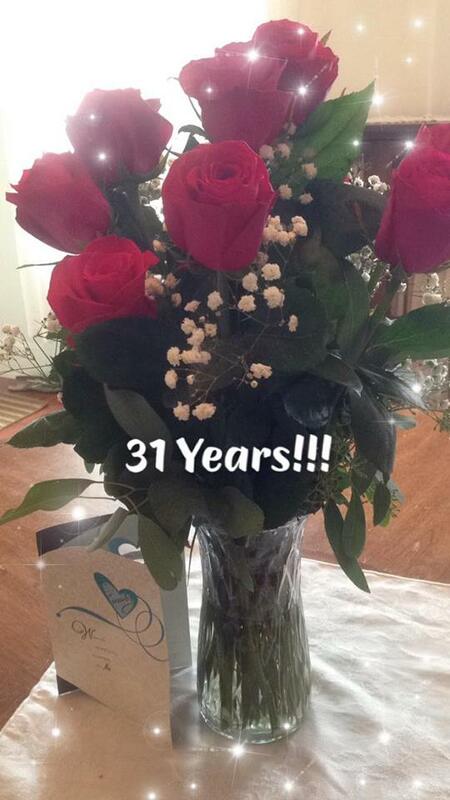 My husband and I celebrated 31 years of marriage last August. 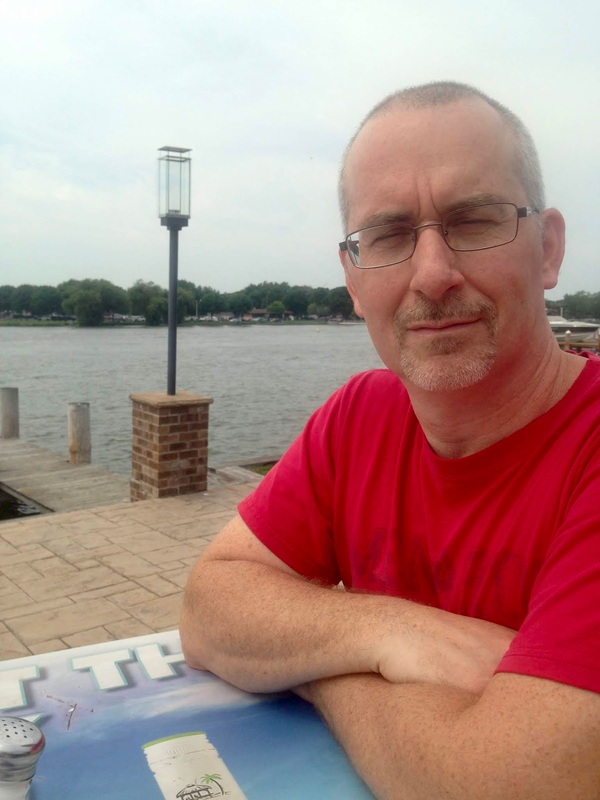 We celebrated our anniversary by going to Oshkosh, Wisconsin for a romantic getaway. 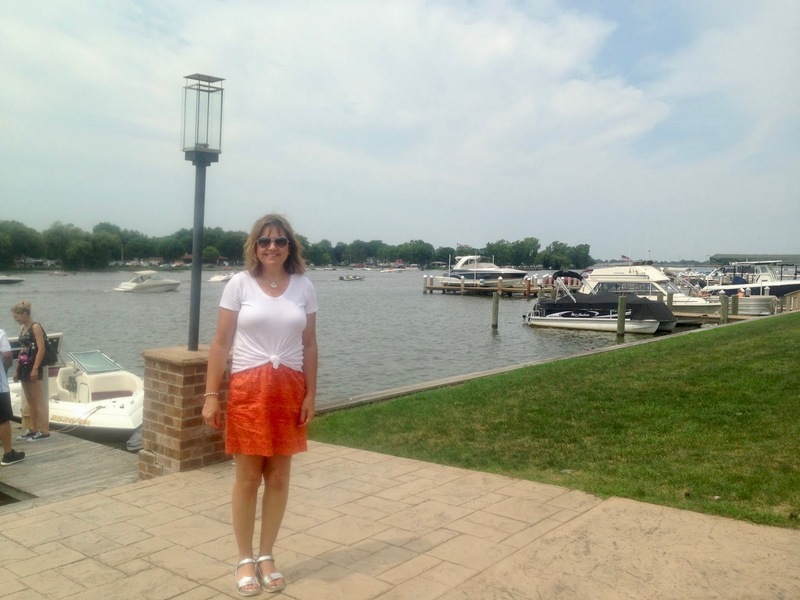 We went to the Paine Gardens and the Paine Mansion, then spent the evening and following morning at a beautiful hotel in downtown Oshkosh along a river. I always make my husband a handmade card for our anniversary. This was the card I made for him. I cased it from THIS CARD on Pinterest. I apologize for the bad photography. For whatever reason, my camera did not like the colors of this card and I could not get a good photo to save my life. 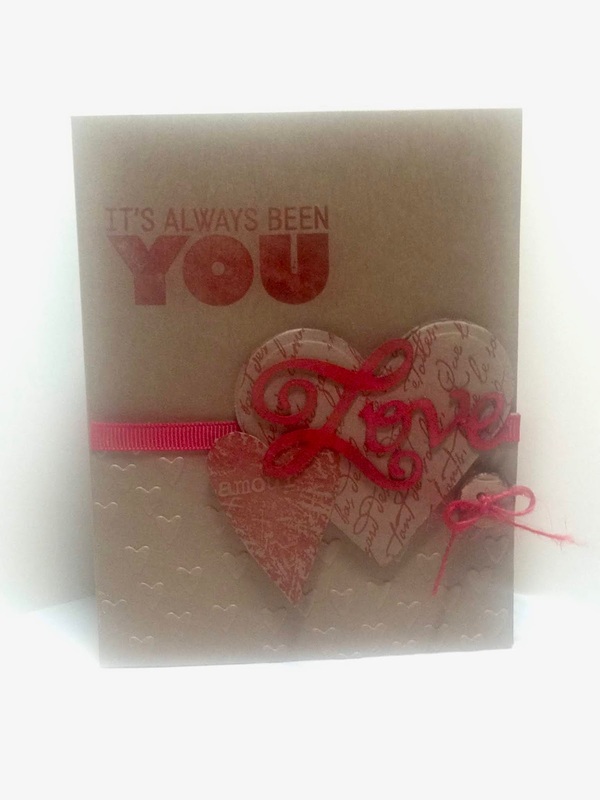 I created the hearts by stamping designs on kraft cart stock with red ink and cutting out heart shapes using dies from Spellbinder's Nestabilties. 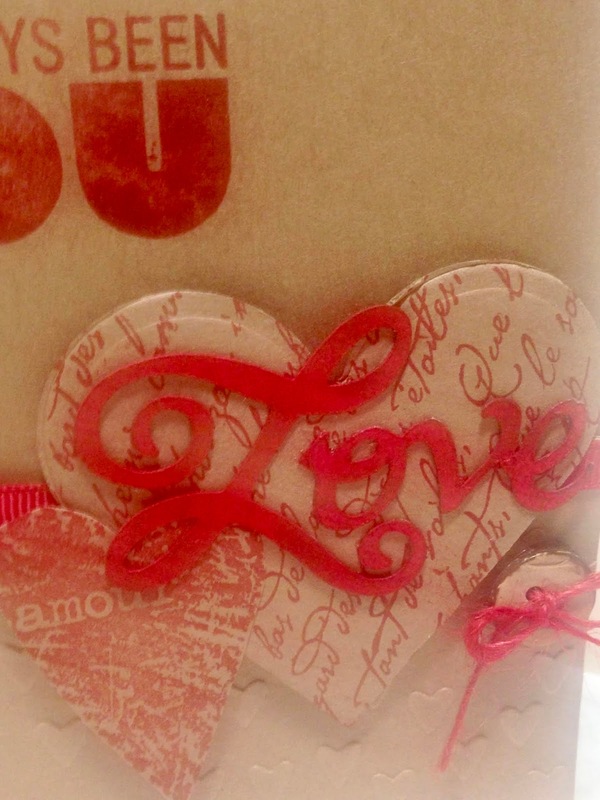 The "Love" sentiment was cut from red card stock using my Cricut Expresson machine. I popped the hearts up using dimensionals and glued the "Love" sentiment directly to the hearts. I added a wooden button for embellishment tying a bit of red string in a bow into the button. The sentiment was stamped in red ink directly onto the main panel. 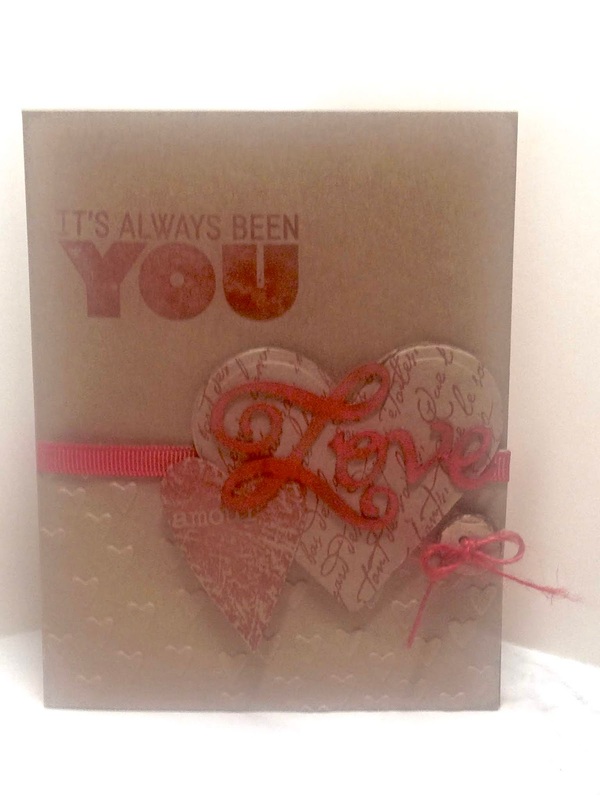 The bottom half of the card was dry embossed with my Cuttlebug machine and a heart folder. A red grosgrain ribbon was wrapped around the dry embossed layer before adhering it to the main card stock panel. And now I'd like to share some personal photos of our anniversary weekend other than the ones you've already seen taken at the Paine Gardens and Mansions. 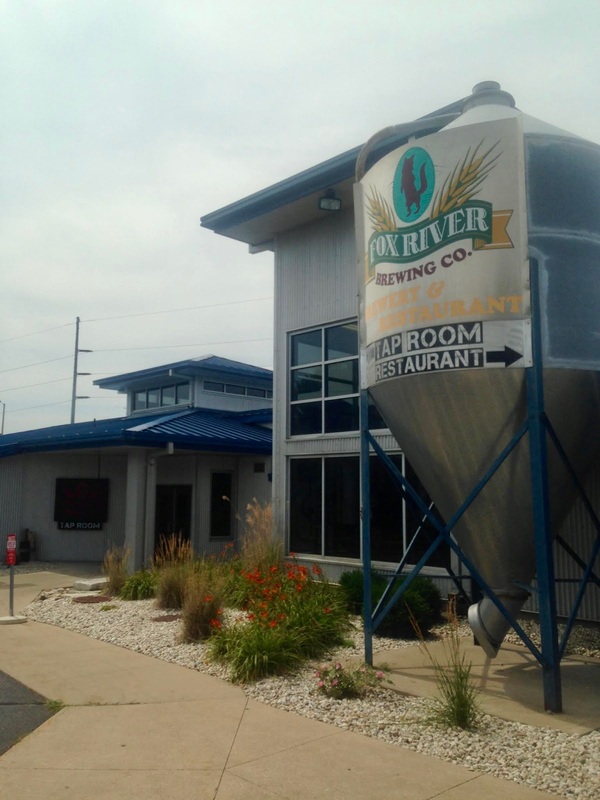 After visiting the gardens and mansion we were starving so I googled "best restaurants in Oshkosh" and the "Fox River Brewery" popped up. So after plugging the location into my GPS off we were! The ratings and reviews of this restaurant were spot on. 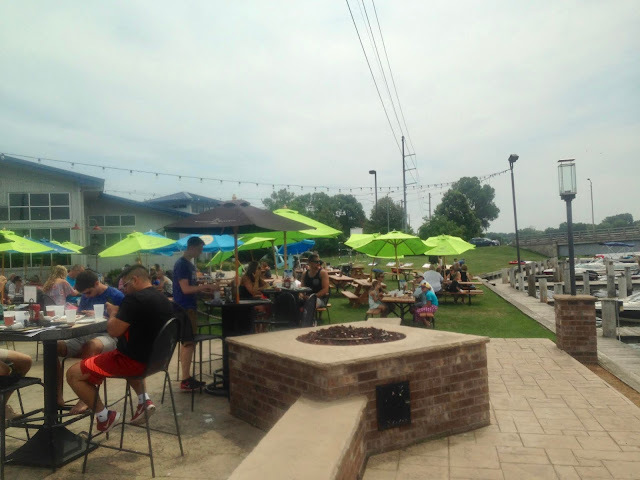 It was located right on the river with indoor and outdoor seating; both offering beautiful views of the river. Since it was such a beautiful day, we chose to sit outdoors and watch the boats go by. 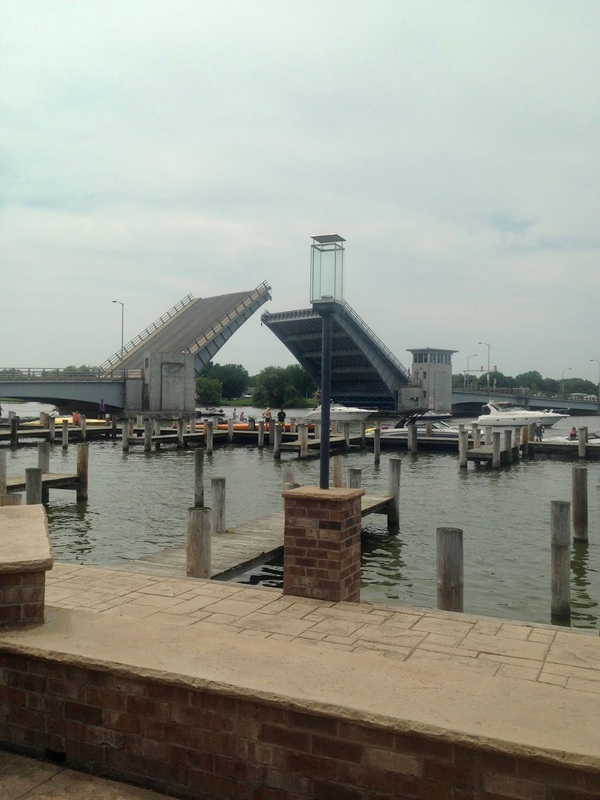 Customers could drive their boats right up the restaurant's piers and dock them while they ate. There was also a draw bridge that was fun to watch go up and down. 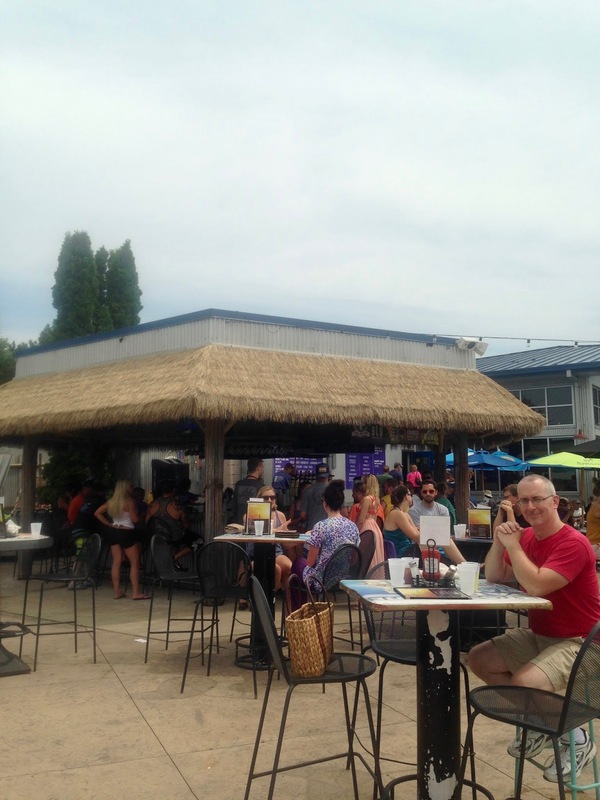 The outdoor seating area also had a tiki bar, fire pits, and heat lamps. 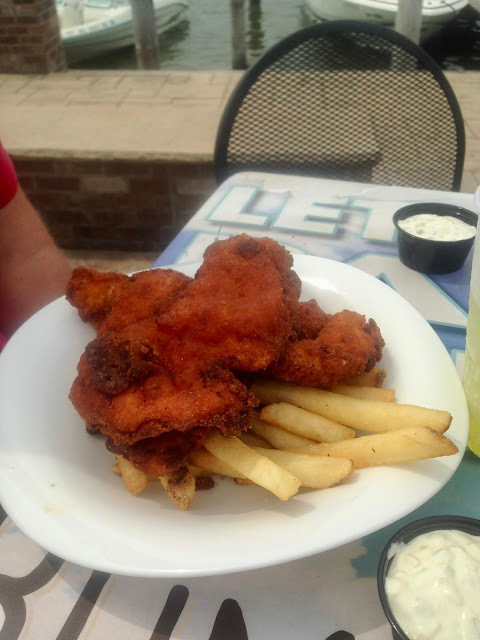 I ordered one of my favorite standbys: a barbecue sandwich and my husband ordered his usual, chicken tenders. 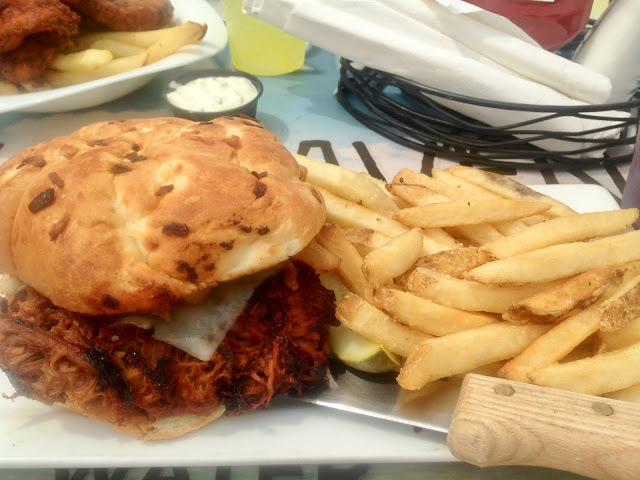 I thought my sandwich was pretty good, but I could have used more barbecue sauce and they did not give me any extra ( I also didn't ask for more sauce as my waitress was super busy). After lunch we checked into our hotel and then walked a bit downtown. 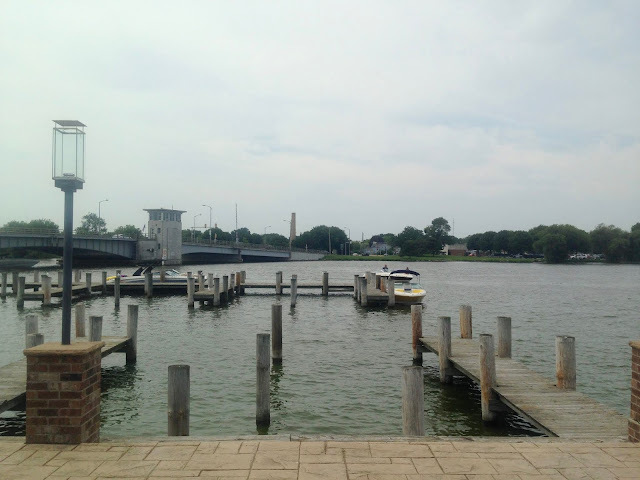 Most of the stores were closed by now, so we got back into the car and drove to the local park "Menominee Park and Zoo" which in addition to a free zoo, had a beach and gorgeous views of their lake, Lake Winnebago. It wasn't a very nice zoo for it wasn't that well maintained, but we still enjoyed visiting the animals. The hotel that we stayed in had a restaurant that was also right on the river and provided indoor and outdoor seating. We had dinner outside along the river again, but this time it was dark and we could enjoy the heat lamps and fire pits. It was so peaceful and romantic. The next morning we enjoyed breakfast at the hotel's restaurant so we could enjoy the river view one last time. Before heading back home, we decided to take a leisurely stroll on their scenic river walk. On our actual anniversary date, I woke up to a bouquet of these beautiful red roses and a romantic card. 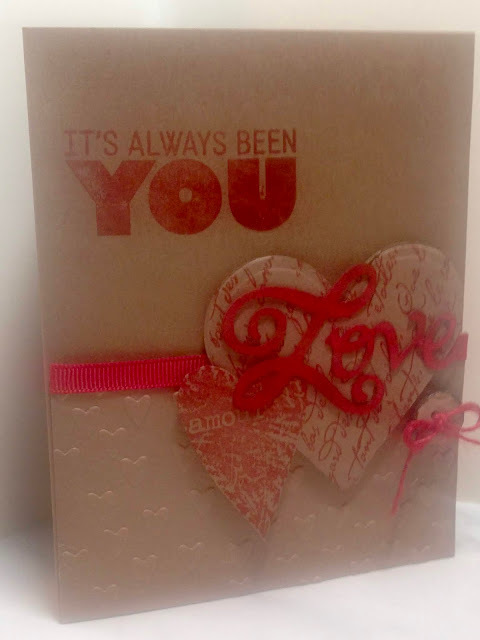 Yes, were in our mid fifties and married over thirty years, but we still take time from our busy lives to celebrate our anniversary and give each other small, thoughtful gifts. I think it's so important to never stop doing that. You don't have to spend a lot of money or go somewhere exotic; we just went to a small town three hours away. Not every anniversary has to be celebrated with a lavish vacation to be enjoyed. Aww, what an awesome way to spend your anniversary! And as usual, your handmade cards are so sweet! What a beautiful card! Happy anniversary! It's a beautiful card Amy, I love kraft and red! Looks like you had a fantastic time too! 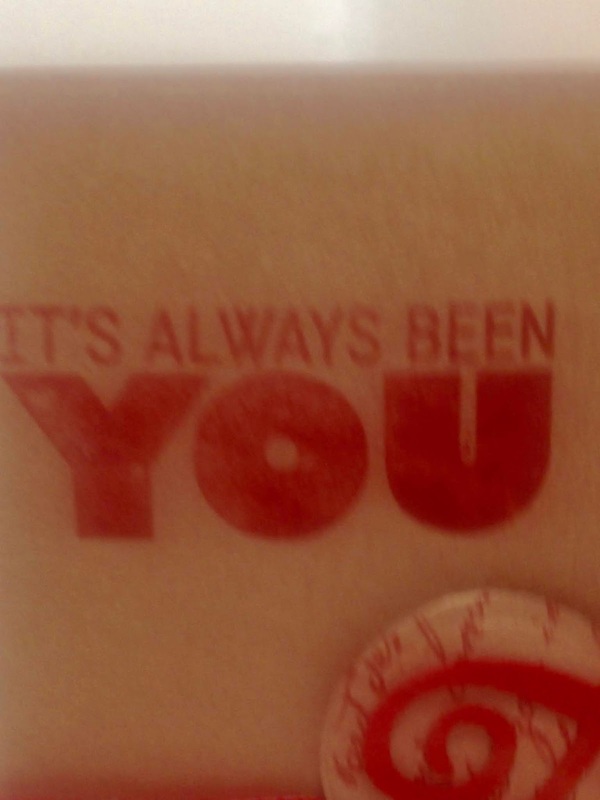 I love the simple message "It's always been you!" Congratulations!